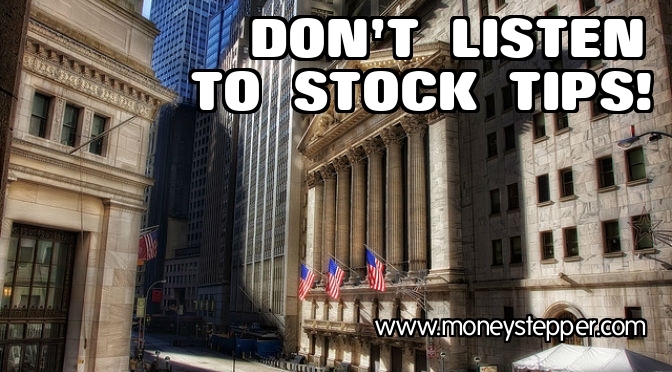 Why You Shouldn't Listen To Stock Tips! Should I listen to stock tips? Hell, no!! You would have heard me say it a hundred times, “for your everyday investor, trying to beat the market just isn’t worth your while”. But, moneystepper, you are saying “average investors”. What if I’m above average? What if I am…AN EXPERT! At the beginning of every year, all newspapers across the world consult their “stock market experts” in order to get there best stock market tip for the coming year. The “business writers” at the Guardian want to “do well”: nicely understated, most Guardian like indeed. The “best performing fund manager” working with The Telegraph wants to “deliver the goods”: a bit more like an advert. As you will find in all our articles, we suggest that the average investor in the stock markets buys a well-diversified low-fee market tracking ETF. So, how are these experts doing? Well, let’s have a look shall we. Imagine we have our £15,000 NISA allowance to invest, and we MUST invest it all on 01/01. Moneystepper would have used the £15,000 buy a world index ETF with Vanguard (Ticker: VHYL). For “the experts”, we shall use the first five suggestions in each of the linked articles above, investing £1000 in each of the fifteen total companies. * Price is taken from 01/01, other than for The Telegraph as these picks were published on 23/01. ** Purchased by BMS. Cash value is takeover price, assuming we sell our shares in BMS on date of takeover. There are a lot of numbers to take in there. Let’s summarize it a little. The Guardian: £5,000 invested would leave us today with £4,858.44 (including dividends) for a total annualized return of negative 3.8%. The Telegraph: £5,000 invested would leave us today with £4,254.28 (including dividends) for a total annualized return of negative 19.9%. The Daily Mail: £5,000 invested would leave us today with £4,897.13 (including dividends) for a total annualized return of negative 2.7%. Total: £15,000 invested would leave us today with £14,009.85 (including dividends) for a total annualized return of negative 8.8%. In comparison, £15,000 invested in the world market ETF would leave us today with £16,319.12 (including dividends) for a total annualized return of positive 11.7%. It doesn’t end there: what about fees? Excellent point! Imagine we are working with a discount broker service online – say SVS securities – which charges £5.75 per trade. Therefore, with the moneystepper ETF option, we would incur one single fee of £5.75. 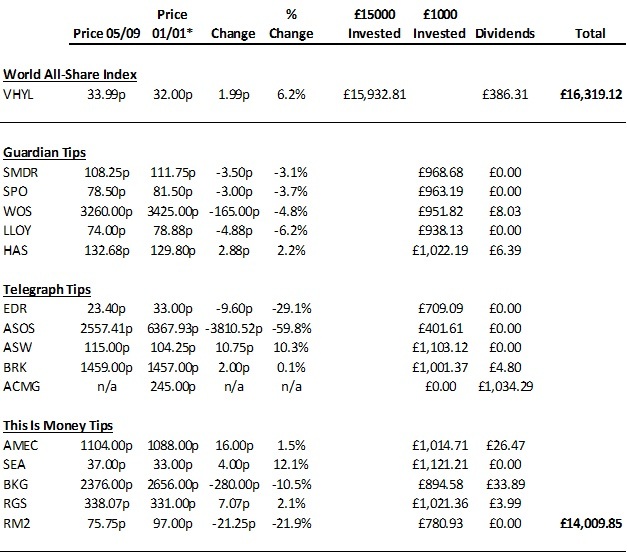 However, with the “stock tips” advice, we would have to buy 15 different shares, and therefore fees of £86.25. This might not seem like much, but it represents 0.6% of our original investment. Therefore, our annualized negative return (with fees) is actually 9.4% for the stock picks. It doesn’t end there: what about managing your investment? Another good point, well made! In our ETF investment, we put our money in, reinvest our dividends, forget about it for 30 years and we’ll be okay. However, due to the impact of “company risk” this can’t be said for the stock picks from the newspapers. Instead, we need to invest time in the future constantly evaluating these individual companies for changes in performance, personnel, financing, market sentiment, dividend policy, etc. As the old adage goes: “time is money”. Use your time (and your money) wisely. Maybe they are just having a bad year? Are we just being selective and harsh on these stock pickers? I don’t think so, no. We have randomly selected their first 5 picks from the articles and the comparison is an actual diversified ETF which makes up a good chunk of my personal investment portfolio. 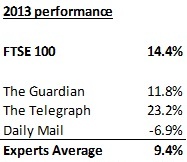 Credit seemingly must go to The Telegraph, but this only averages out the 19% losses they have noted this year. You can see that 2014 isn’t a one-off. I’m afraid, it is the norm! “Stock picks” are primarily designed to help sell newspapers. They are not designed to help you benefit financially in the long term. At best, they are a lottery. Our advice: just turn to the next page of the newspaper or to the next website. Ignore them. Buy diversified, low-fee market tracking ETFs and get on with enjoying your life (safe in the knowledge that you are probably beating those “experts” anyway). Stoke market or online currency market are always move on their own Marcy. We don’t make any attempts to time the market because this market is so unfortunate and risky as that always felt like a losing proposition.